I swear this Fall has been moving at warp speed, I'm having a hard time coming to grips with all of the Christmas talk already! 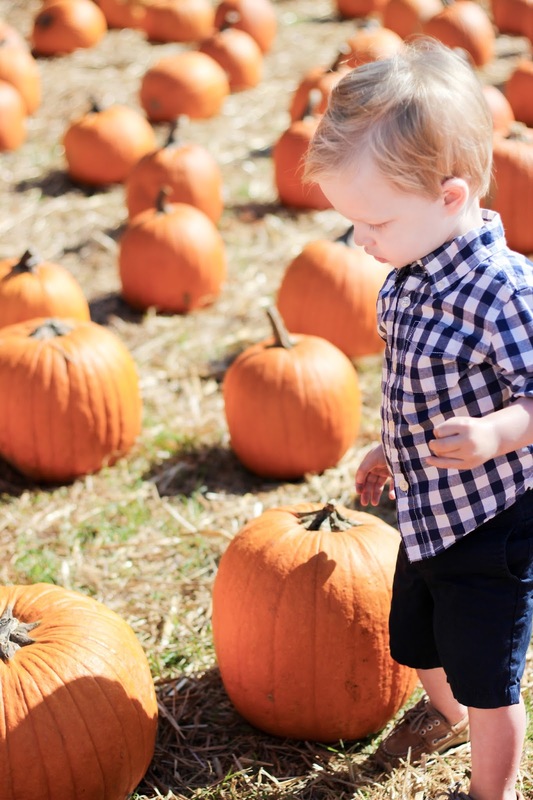 The past few weeks we've squeezed in a lot of things including a trip to the pumpkin patch, which really didn't go too well with a teething toddler. Counting down the days until those molars are in! Rowan really could have cared less about the pumpkins, was neutral with the hayride, and wanted nothing to do with the petting zoo. But we did learn he loves the jump castle so he perked up a bit after that! It was fun (and hot!) but far different than last year when he couldn't run away from me as I was snapping photos. Then just as we were adjusting back to Charleston time post-Hawaii, it was Halloween! I made some treats up for Rowan's buddies at school, which included an apple juice box, Annie's Homegrown Halloween Bunnies, stickers, and a lollipop. 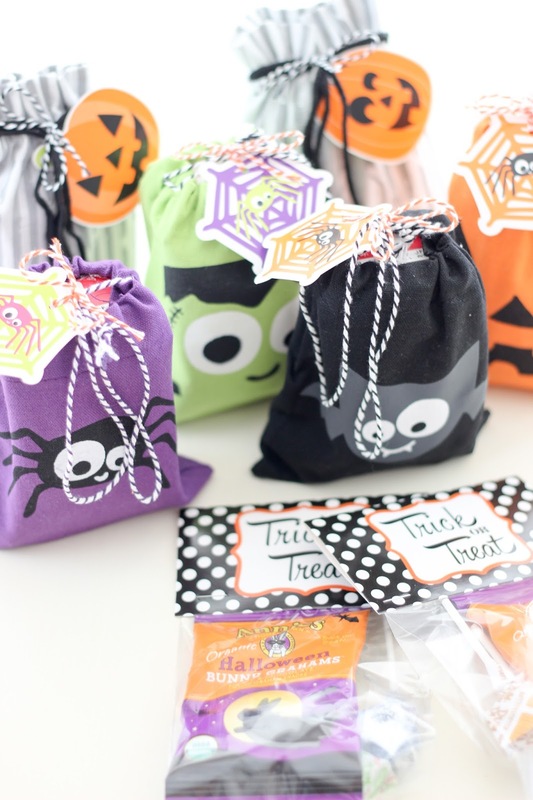 Got to love those festive Target Dollar Spot bags! 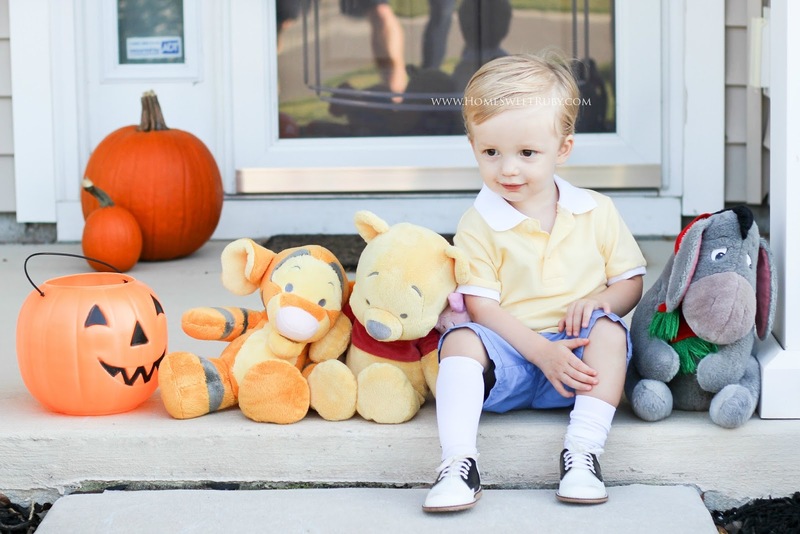 We didn't do a family Halloween costume but I love how Rowan's Christopher Robin costume came out! Knowing our toddler's unpredictability with clothing, we tried to come up with something that he wouldn't realize was actually a costume and I think we succeeded! I made the shirt from two separate polos and everything else we already had or borrowed. He enjoyed carrying around his Tigger stuffed animal for approximately 3.5 seconds while trick-or-treating, which mostly consisted of walking as slow as humanly possible to each house, clinging to me, and telling our sweet neighbors "no" when they tried to give him something other than a lollipop. Ha! It was still so much fun and I'm glad we took him around our little neighborhood, there were tons of kids (we handed out 3 Costco-sized bags!) and I'm hoping it helps him be a little less shy next year. Plus we get to eat all of the non-lollipops so I'm going to call that a win. I hope you all had a fun Halloween! This weekend you'll find me baking lots of pumpkin things and hoarding all of the pretty Target Christmas purchases in our guest bedroom. I just can't with the decorating yet, but that doesn't mean I can't shop... right? P.S. Lots of festive things coming to the blog soon plus I'll be doing an event at World Market in Charleston next weekend! I'll share more as it gets closer but I'd love to see some locals!! 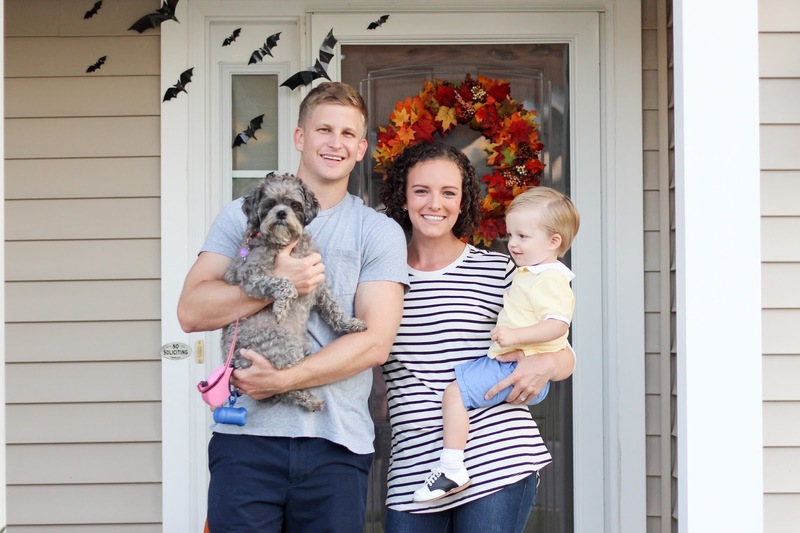 Love your family picture! And I agree with the above comments about the bats! They're so cute! What an adorable costume! 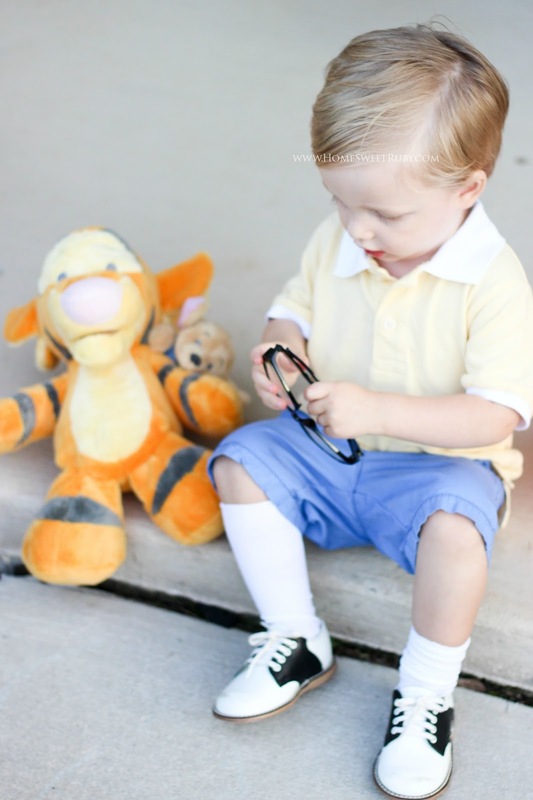 I just love him as Christopher Robin! I cannot believe you had so many trick-or-treaters! We don't have a ton of kids in our neighborhood, so we barely made it through one bag from Costco. I die over that picture of him on the porch with the stuffed animals!!! Cutest guy ever!! Ahhh! That outfit is exactly what I'm looking for! Bummed that I can't buy it (but so impressed that you made it!) I'm looking for something similar for my sons first birthday next month! It's Winnie the Pooh themed.